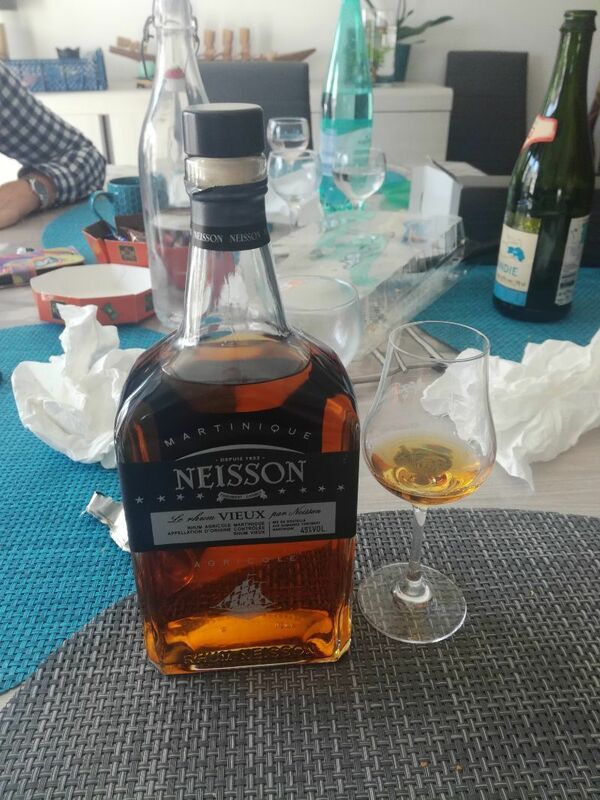 Have you found an online vendor selling Neisson Le Rhum Vieux Par Neisson? Bronze color with greenish gray reflections. The nose is on citrus with a pastry side, butter, nuts. Exotic fruits with banana.On the palate, citrus fruits are always present and later arrives the woody and spices. Nice length in the mouth. A nice rum well done. Assez viril. Nez vanillé, plus épicé en bouche et boisé mais aurait pu l'être encore plus. Just back from this years rumcruise at the Baltic Sea with Birka cruises. It’s a fantastic opportunity to taste new rum, rarities and old favourites. I attended at two Master classes. This Rhum represented a mid aged Agricole at a class with the theme diversity of rum. The included distillate in this Neisson is between 3 and 9 years old. It’s quite smooth, dry and complex. You can recognise wood, fruits, vanilla and grass. Enjoyed a mini bottle of Neisson Vieux while vacationing in Fort de France Martinique. Pretty basic bottle and label design. Cheap at EUR 19 for a real sized bottle. Strong Rhum Agricole notes like grass and plenty of wood to your nose and palate. Mild citrus and then more oak. Very long lingering afterburn. Rhum Agricole lovers can easily add 2 points to my score. As this rum hasn't had any sugar added, it has a wonderfully clean flavour, with a nice early spiciness followed by a gentle firey aftertaste. For those less fond of overly sweet rums, this is delicious. Rhum vieux agricole de Martinique. Assemblage de rhums entre 36 et 60 mois. Titre 45°. Présentation : étui en carton, bouchon en liège, la bouteille est élégante, design épuré le rhum a une couleur ambrée. Nez : fruits confits & épices. Dégustation : attaque douce suivie de notes d'épices, vanille et de boisé. Longue finale avec une touche végétale. Un bon rhum, meilleur que l'ancien réserve spéciale qu'il semble remplacer.